Pure business. The ZBook series may be new, but its first models are coming out with a bang. 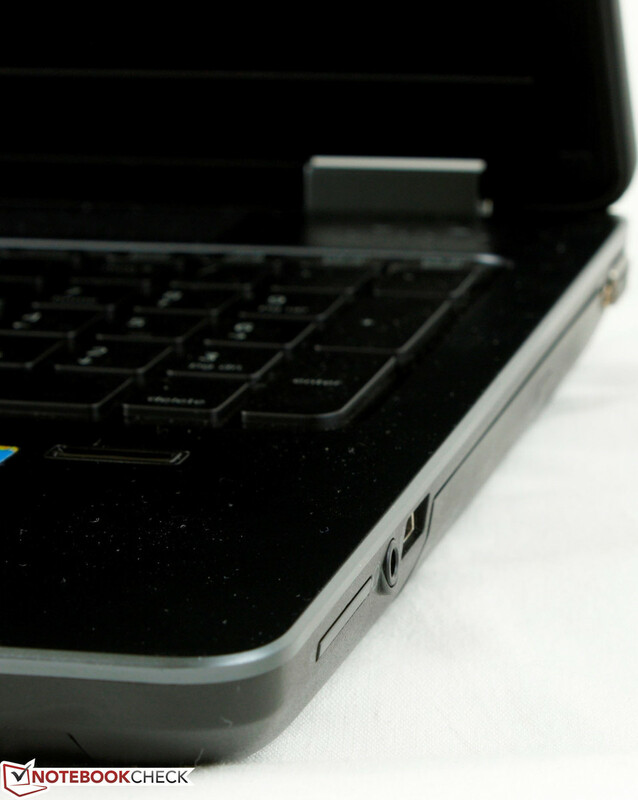 Following on the footsteps of the ZBook 17, the ZBook 15 is everything the EliteBook series is and more. We take a closer look at the $2999 model in this full review. Mobile workstations are in a league of their own compared to consumer class or even business class notebooks. They are relatively large, pricey, bulky and anything but minimalistic. However, we’d be damned if they couldn’t get demanding workloads done swiftly and reliably. 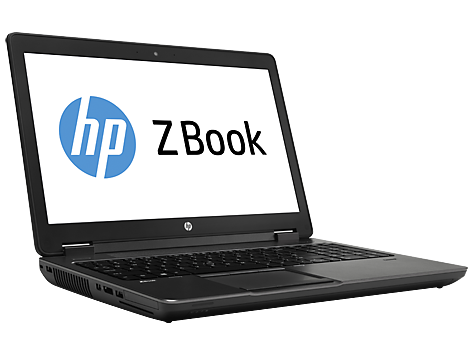 The HP ZBook series succeeds the admittedly crowded ProBook/EliteBook series of workstations and starts afresh with a new, simpler naming convention. 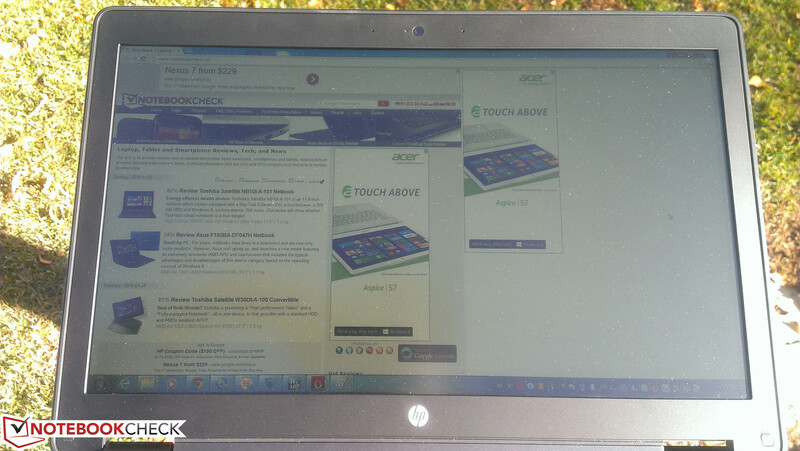 We touched upon the ZBook 17 in-depth late last year and walked away quite impressed. 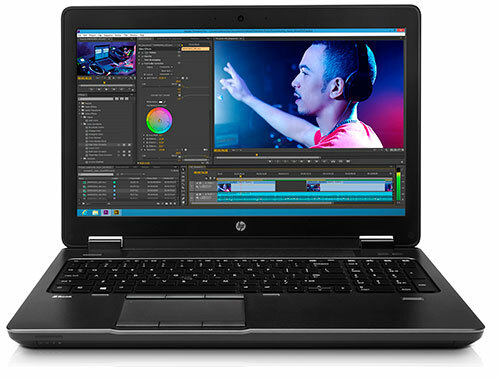 The new series is more than just a simple name change; it’s also the most overhauled iteration yet of an HP workstation. 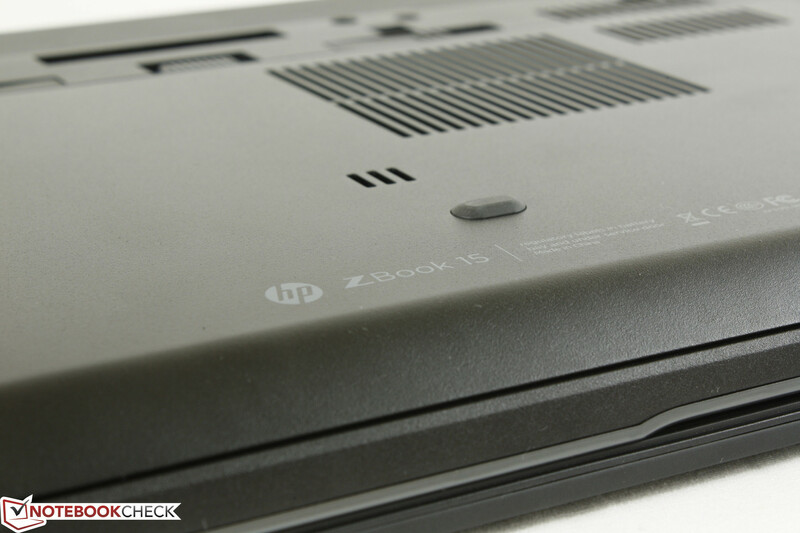 Our ZBook 15 in review continues this trend and is physically identical to its bigger brother including the chassis material and feel of the keyboard. The model on hand is equipped with a Core i7-4800MQ, 16 GB DDR3L RAM, Quadro K610M graphics, 500 GB 7200 RPM HDD + 32 GB SSD cache and a 1080p display. Combined with its wide-reaching connectivity options, the ZBook 15 starts at $1699 and can top $2999 retail. How well does the ZBook 15 stand against the likes of Dell and Lenovo in the mobile workstation arena? Like the larger ZBook 17, case quality is excellent all-around on the ZBook 15. The aluminum alloy lid and bottom plate are rigid and will only warp minimally under moderate pressure. 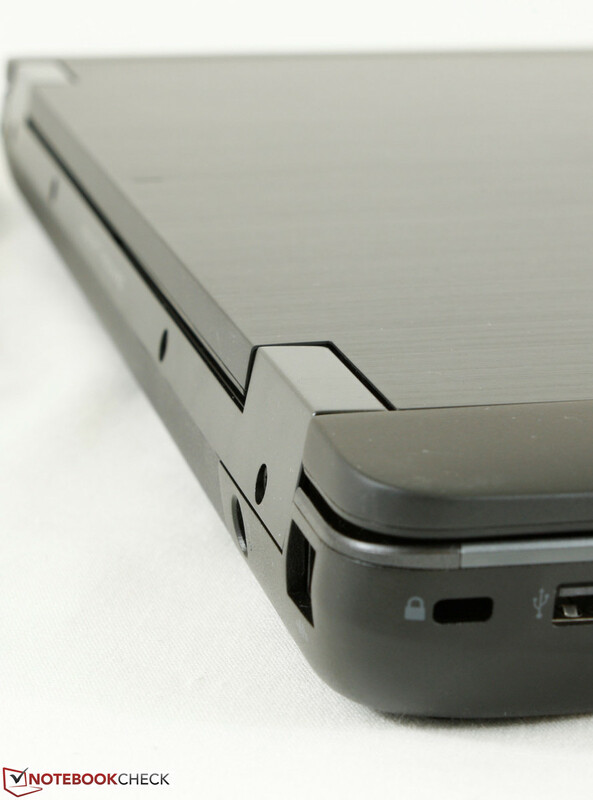 Resistance to twisting and vibrations are also excellent on the lid, base and hinges, which is similar to the EliteBook predecessors. 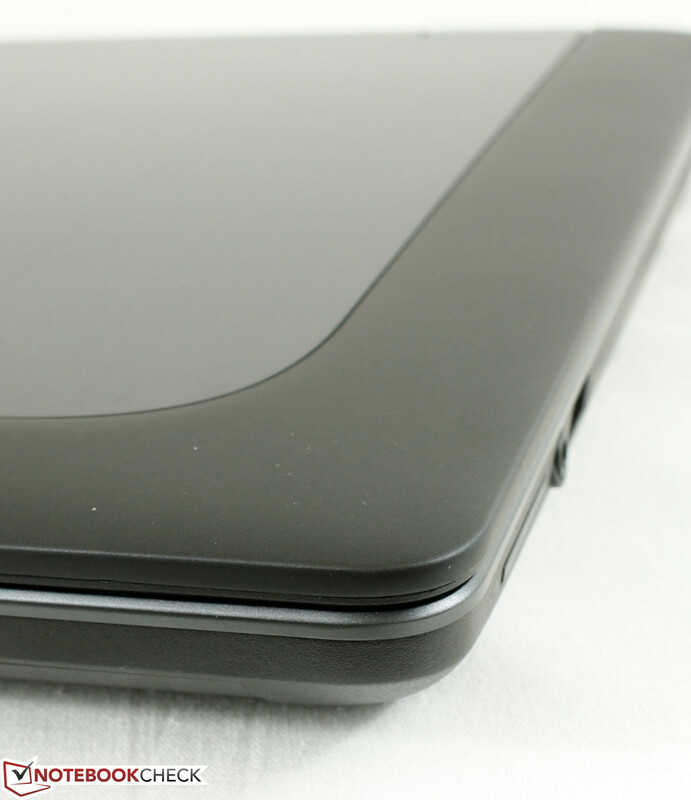 Since the ZBook does not utilize a unibody design, certain areas like the inner display bezel and palm rests can feel plastic, but are otherwise thick and just as tough to the touch. The industrial design of the model is surprisingly attractive for a mobile workstation and compares favorably against Dell Precision models or the Lenovo ThinkPad W series, both of which incorporate boxier and generally more lackluster designs. 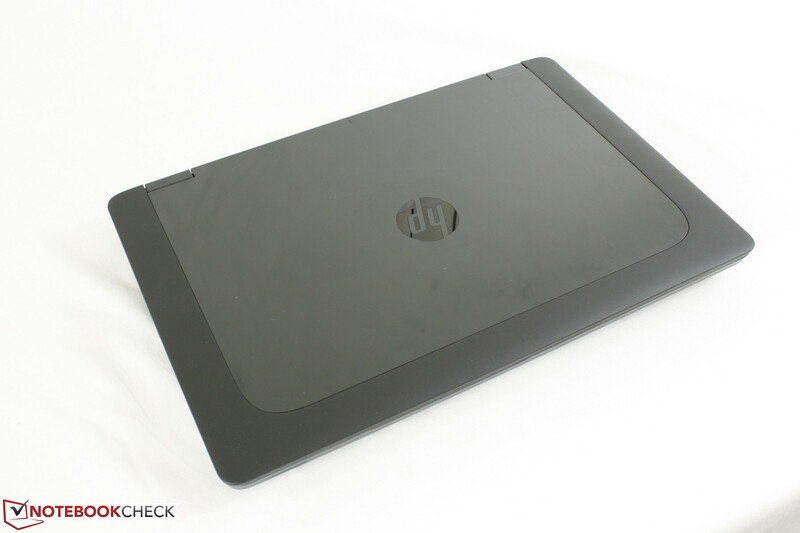 HP advertises its wedge design of the ZBook as innovative and sleek, which isn’t saying much for a workstation, but is enough to stand out against its duller competitors. 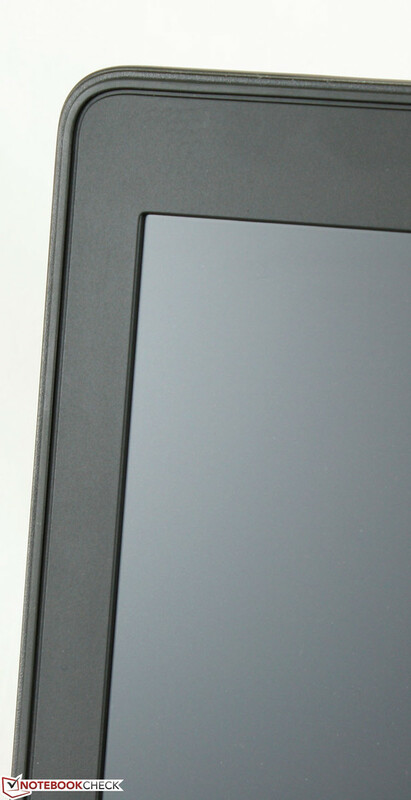 The rubberized perimeter and edges of the lid, for example, feel purely aesthetic, but notably adds to the appeal of the all-matte and jet black ZBook 15. HP has managed to build an aesthetically pleasing workstation while remaining relatively light (2.82 kg) and thinner (30.5 mm) than the ThinkPad W530 (2.81 kg, 36 mm) and Precision M4800 (3.18 kg, 40 mm). 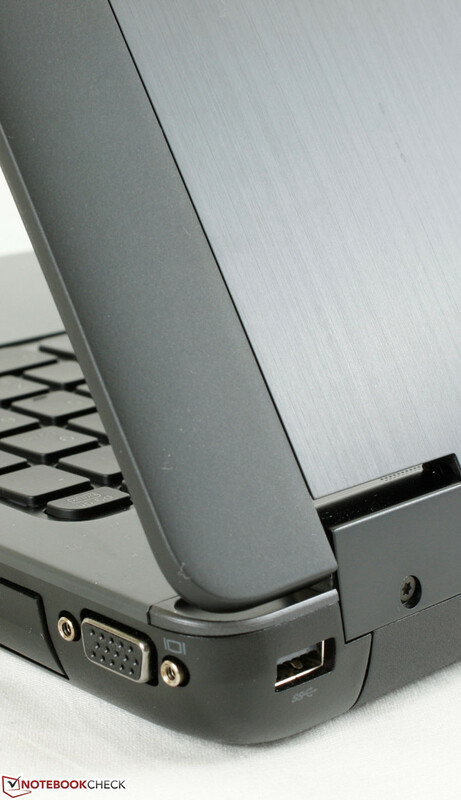 A particular design choice carried over from the EliteBook is the removable screwless plate underneath for quick access to internals or HDD removal. 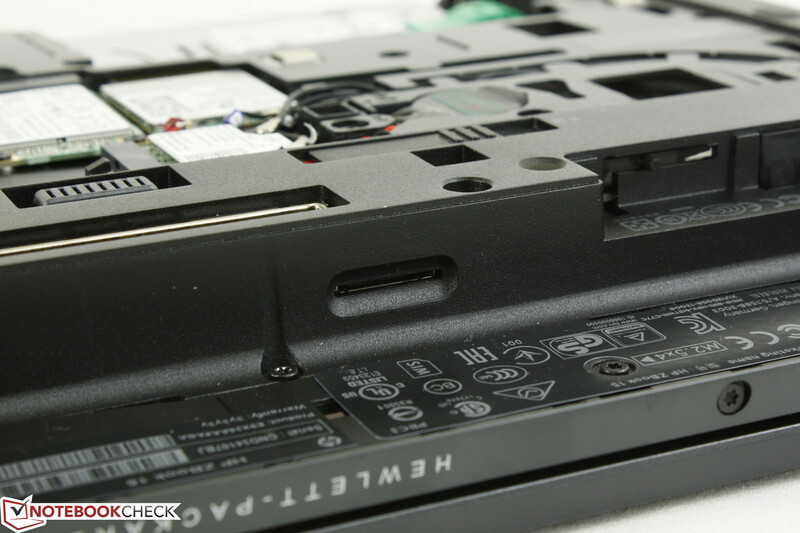 According to HP, the screwless design was a hot request from users who may not always have the appropriate tools ready, so general upgrades are made much easier. It would have been great to have the optical drive be an easily accessible modular bay for even more expandability, though this is a minor complaint. 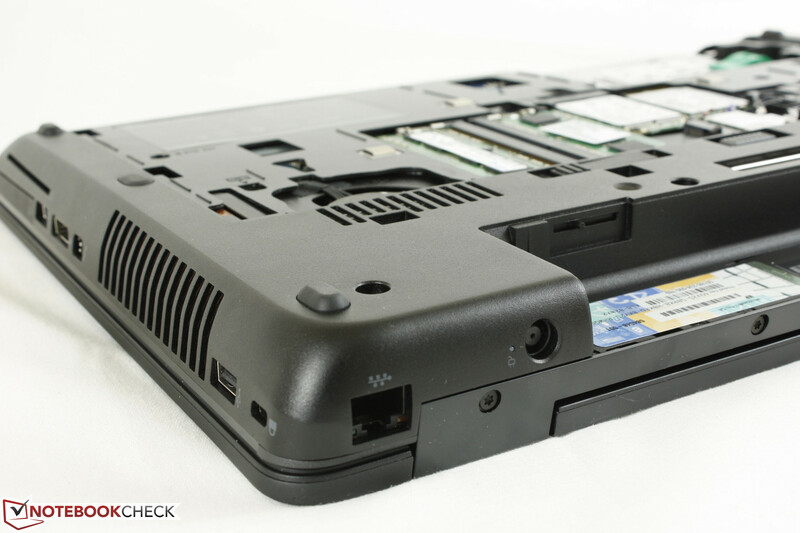 Workstations generally have the most connectivity options available in a notebook and the ZBook 15 is no exception. Both DisplayPort and Thunderport are available as well as a USB 2.0 port and VGA-out for legacy support. There are no HDMI, Firewire or eSATA ports, however, as found on the Precision M4800 and ThinkPad W530, respectively. There is a proprietary docking port for additional connections down the road. Port positioning is always tricky when there are so many connections to work with. 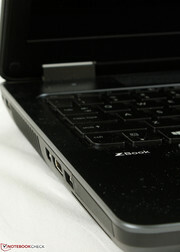 On the ZBook 15, ports are seemingly placed at random on three of the four sides. We would have liked for some of the ports to be moved closer to the rear to save desk space, especially the DisplayPort and Thunderbolt ports as their respective cables tend to be thicker or more rigid than USB or audio cables. 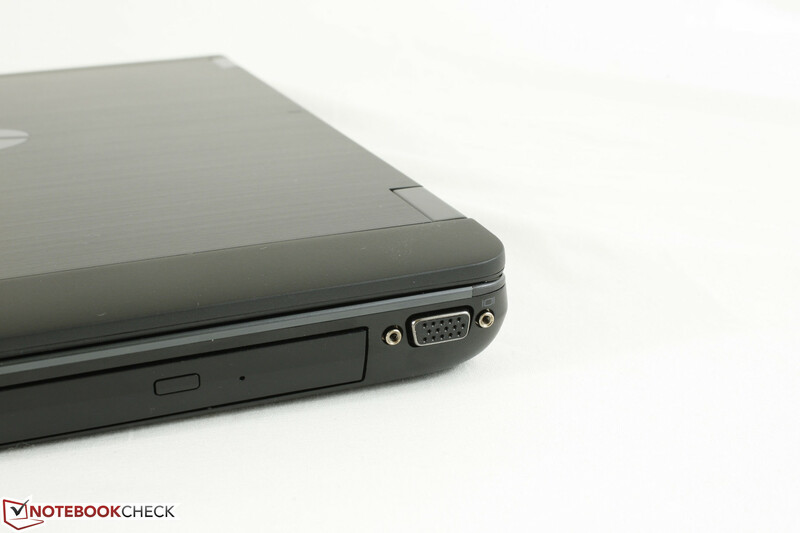 The available SIM slot can only be accessed after first removing the battery module underneath. 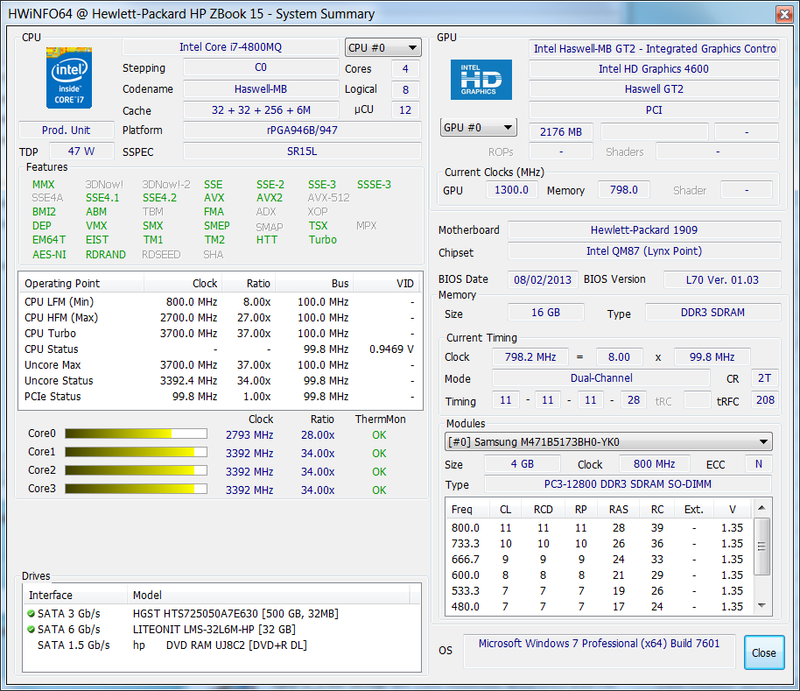 Both WLAN and WWAN are configurable on the ZBook 15 with support for SIM cards and UMTS/HSPA+. 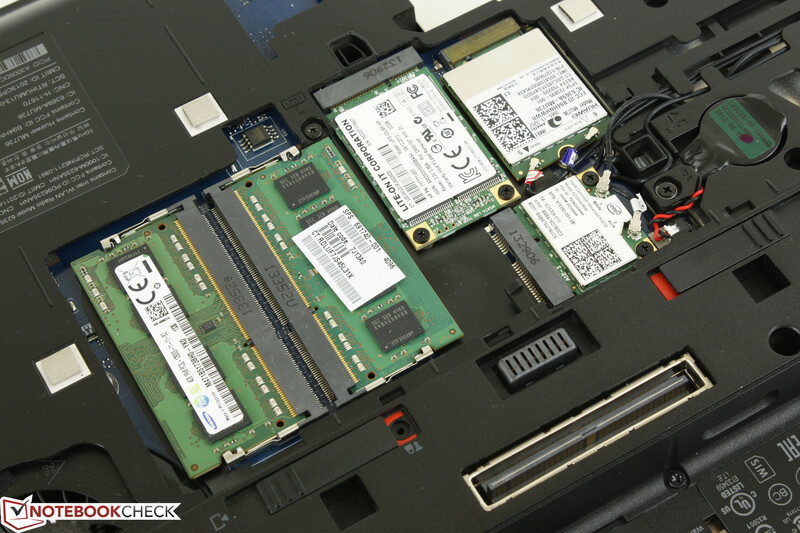 Our model is fitted with a dual-band (2x2) Intel Centrino 6235 as found on a number of newer Ultrabooks like the Asus Zenbook Prime UX31 for WLAN speeds up to a theoretical 300 Mbps and an HP HS3110 WWAN PCI-e MiniCard for 3G connectivity with WCDMA/HSPA/HSPA+ or EDGE/GPRDS/GSM networks. We had no random drops or connectivity issues with the WLAN or GPS radios. 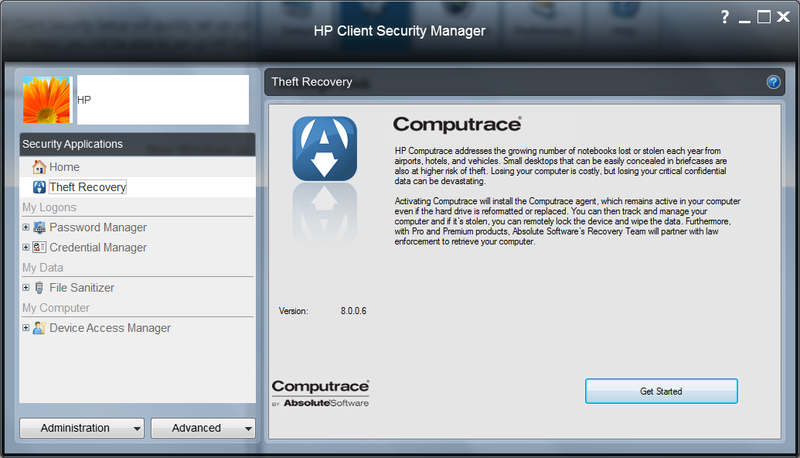 Data protection is premium for workstations, which is luckily one of HP’s strong points as a global IT business. The ZBook 15 ships with a number of protective software and hardware features from its fingerprint scanner and Smart card support to TPM 1.2 compliancy and Client Security programs from both HP and Intel. 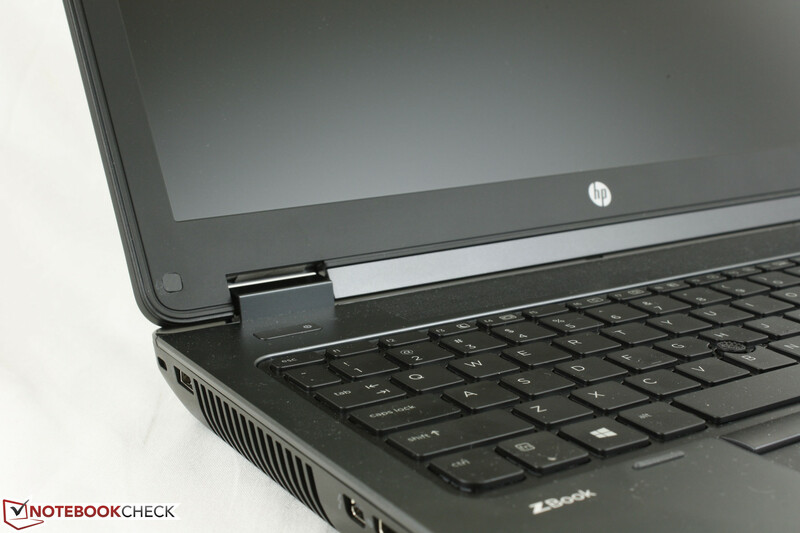 Beyond the expected Kensington lock for anti-theft, the HP 3D DriveGuard software makes use of an accelerometer to lessen the risk of a hard drive head crash in case of falls or impacts. 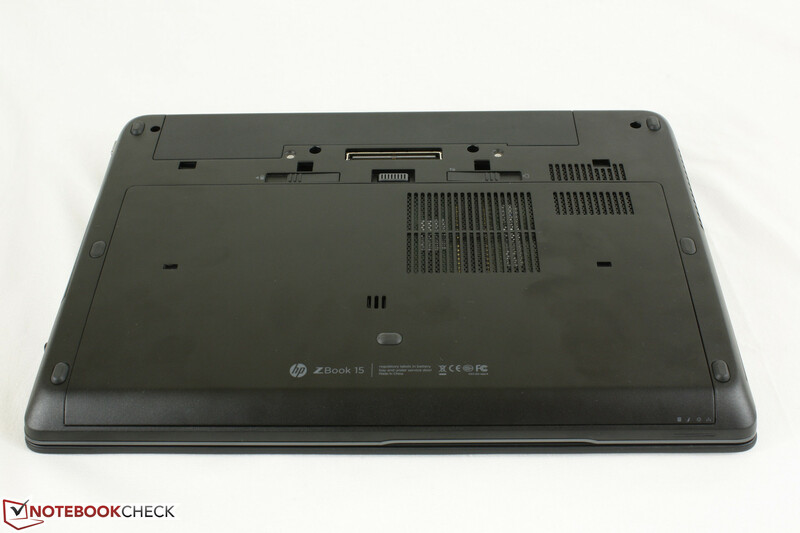 Add-ons abound for the ZBook 15, including generic port replicators from HP and dedicated docking stations that make use of the docking port. The docks add a plethora of connections including DVI, eSATA adapters, Parallel ports and Serial ports. 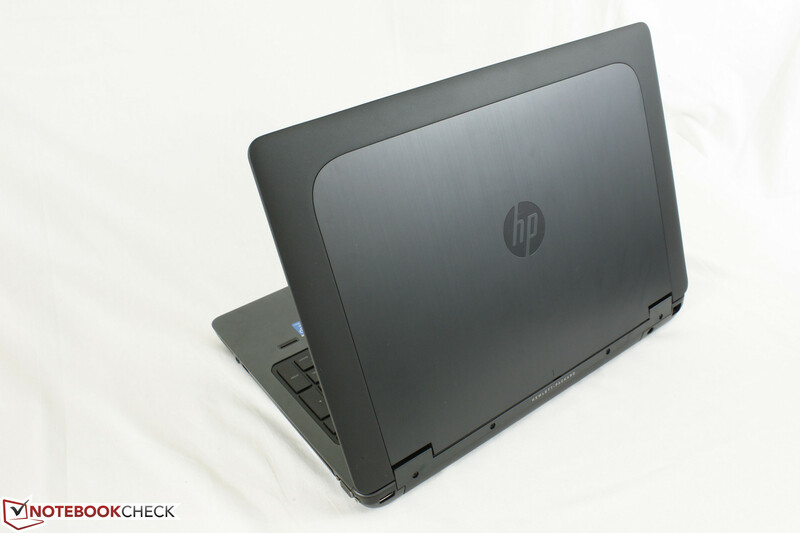 HP throws in a 3-year warranty with plenty of additional options via their Care Pack program. Protection ranges from simple warranty extensions to 24/7 repair support. 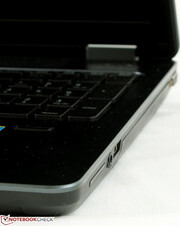 The backlit keyboard (35.25 cm x 11.5 cm) is identical to that of the ZBook 17 and performs similarly. The keys provide somewhat soft feedback with short travel when pressed, but are otherwise responsive and easy to use. 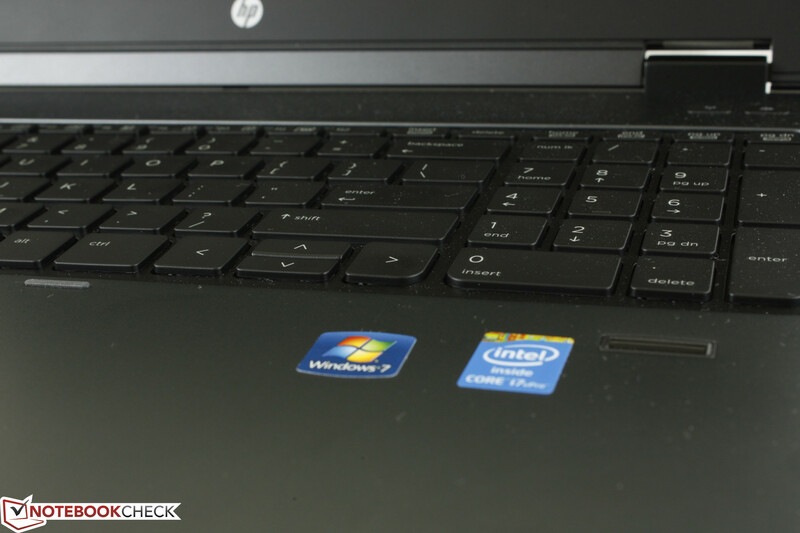 More information on keyboard performance can be seen in our full review of the ZBook 17. 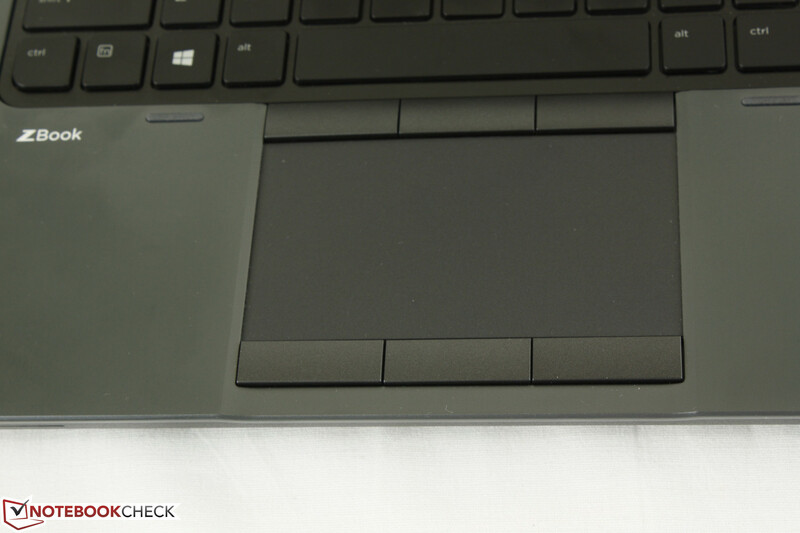 Despite the ZBook 15 being physically smaller than the ZBook 17, their touchpads are identical in size (103 x 59 mm) and feel. 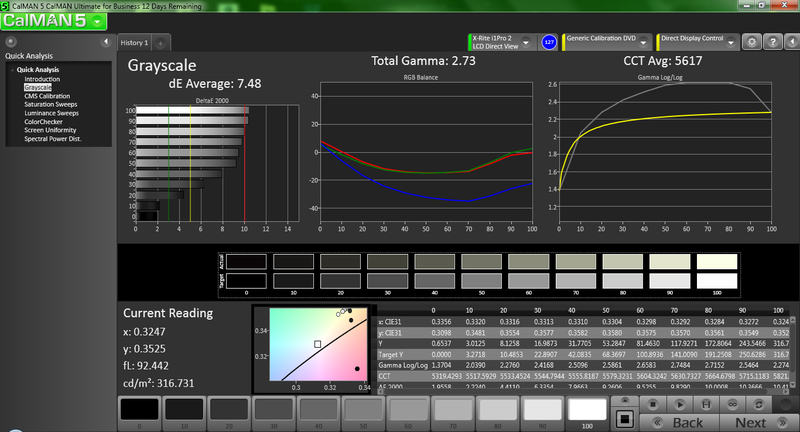 Both use the same Synaptics LuxPad V1.6 software and are smooth and precise for reliable use. Multi-touch gestures up to three fingers are configurable and tapping anywhere on the touchpad will register a left click by default. 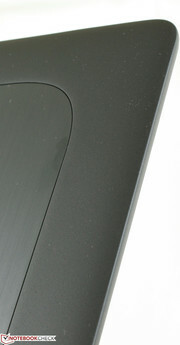 For general use, we found the touchpad to be a bit easier to control than the concave track button. Meanwhile, the surrounding six buttons are all configurable with quiet-but-firm responses when clicked. 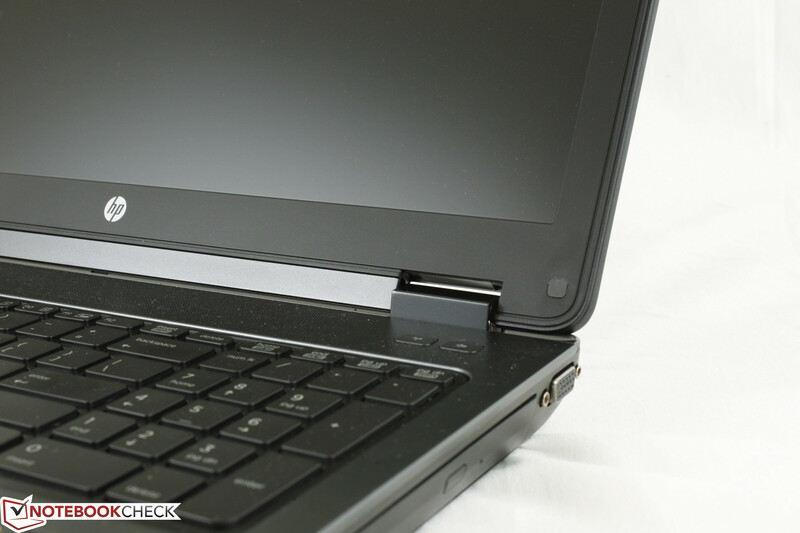 They are useful as shortcut keys and feel much more uniform than the keys of the Precision M6800 or ThinkPad W530. These keys on the HP are a bit too easy to depress, however, so accidental inputs can occur. The AUO11ED B156HW01 display is 1080p and, like most other workstations, a matte IPS panel for better viewing angles and colors. Texts and images appear clear with no significant ghosting or bleeding issues. Though 1080p should be sufficient for most users, notebooks in general are beginning to move to higher resolutions and denser pixels. The Precision M4800, for example, has already made the move to a 3200 x 1800 resolution display, so we fully expect future ZBook models to follow suit. Our measured screen brightness averages close to 300 nits, which is sufficient for a 15.6-inch matte display under indoor lighting conditions. Maximum brightness will not artificially drop if disconnected from external power. Its contrast of about 550:1 is nearly half that of the Preicsion M4800, but is otherwise comparable to the ThinkPad W530 and MSI GT60. While these numbers would be great for a consumer notebook, they are about average for a workstation in this price range. A side note on the backlight is its slow response when attempting to decrease or increase brightness. We experienced this same small issue on the ZBook 17 and it appears to be a simple software problem across the current ZBook generation. Unfortunately, color space reproduction does not cover the majority of the AdobeRGB spectrum and is instead closer to sRGB. 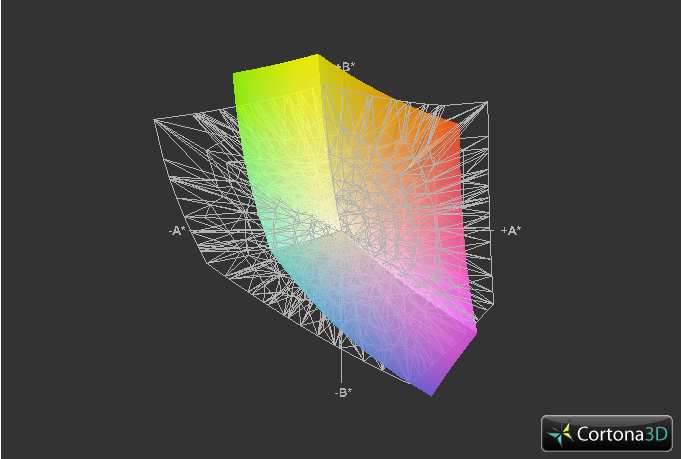 This is similar to the display of the Precision M6800, where about 90 percent of sRGB is covered compared to < 60 percent of budget notebooks with cheaper panels. This may be sufficient for certain digital graphics artists, but those in need of a wider gamut can consider the ZBook 17 where we measured coverage of about 93 percent of the AdobeRGB standard. 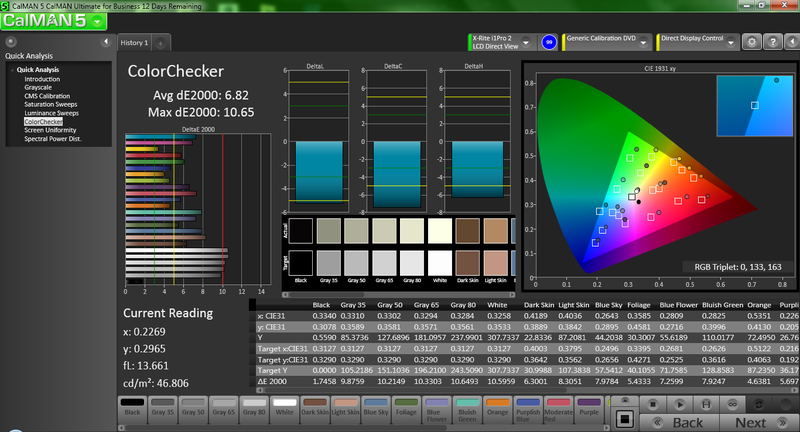 Otherwise, users should upgrade to the DreamColor display on the ZBook 15 for better color reproduction. Further display analyses were performed with an X-Rite i1Basic Pro spectrophotometer. The display will benefit from a calibration as it creates a flatter RGB balance with a gamma closer to the 2.2 ideal as defined by the sRGB standard. Color accuracy increases with increasing saturation levels, but it is still very good even at low saturation with a DeltaE 2000 of about 7 units at worst. Teal is represented less accurately than other colors. Outdoor usability is passable if direct sunlight can be avoided. The matte display helps with visibility and reducing glare and the relatively powerful backlight minimizes washed out colors if only marginally. Nonetheless, it is not bright enough to deter sunlight for extended outdoor viewing. Use under shade at maximum brightness is recommended for a more comfortable experience. 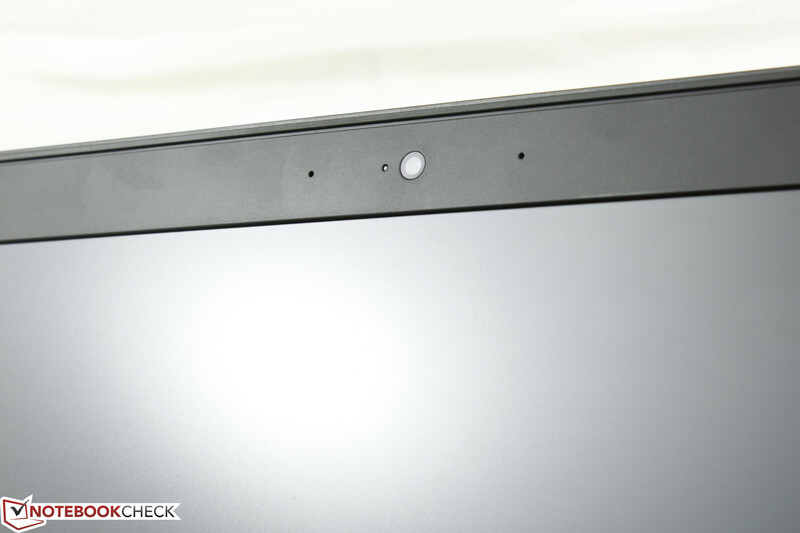 Viewing angle stability is excellent as this is an IPS panel. Colors do not degrade at extreme angles for a wider viewing window compared to most budget notebooks. Combined with the 180 degree hinge and matte display, sharing the screen with nearby friends or coworkers should not be a problem. 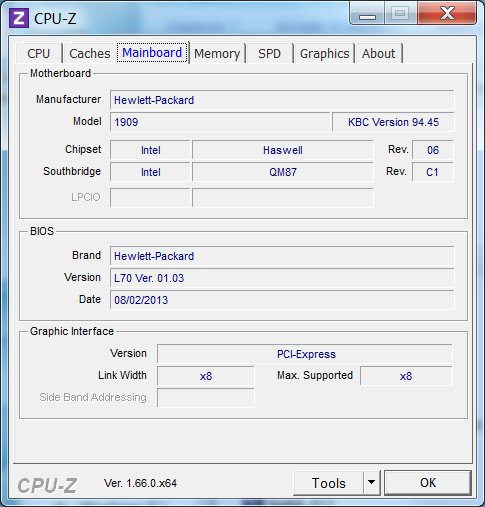 HP offers just three configurable Haswell CPU options: the 2.4 GHz i7-4700MQ, 2.7 GHz i7-4800MQ and 2.8 GHz i7-4900MQ. All models are high-end processors and are some of the fastest available of this generation. 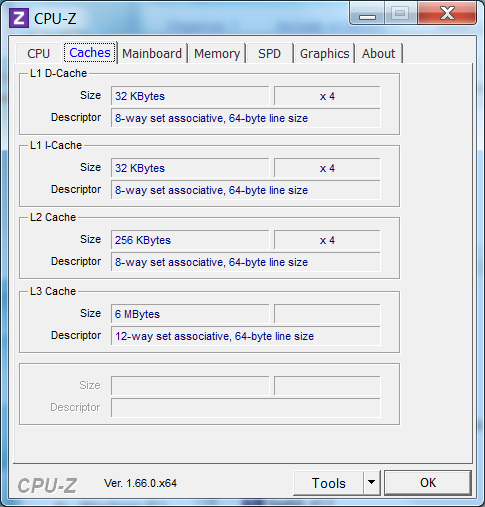 Beyond the slight clock rate differences, the highest model adds 2 MB of L3 cache for a total of 8 MB. The models are otherwise identical in performance specs, including their integrated HD 4600 GPU, while the two higher models include more security features (i.e., vPro, VT-d and Trusted Execution) that may appeal to larger businesses. 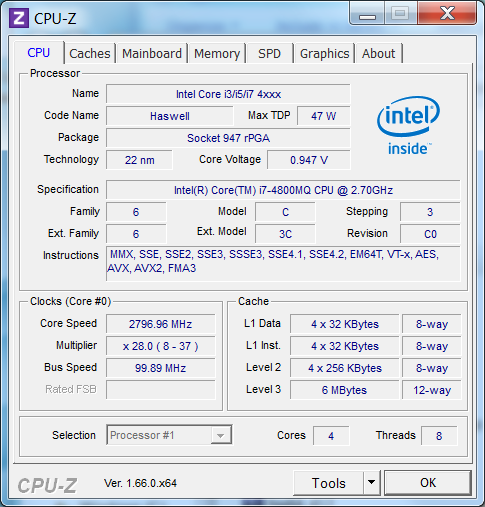 These Haswell CPUs can idle at 800 MHz when not under load. RAM is provided by four DDR3 PC3-12800 SODIMM modules from Samsung for a total of 16 GB. Two of the modules are easily accessible via the maintenance panel underneath, though the other two will require a bit more tinkering with screwdrivers to access. 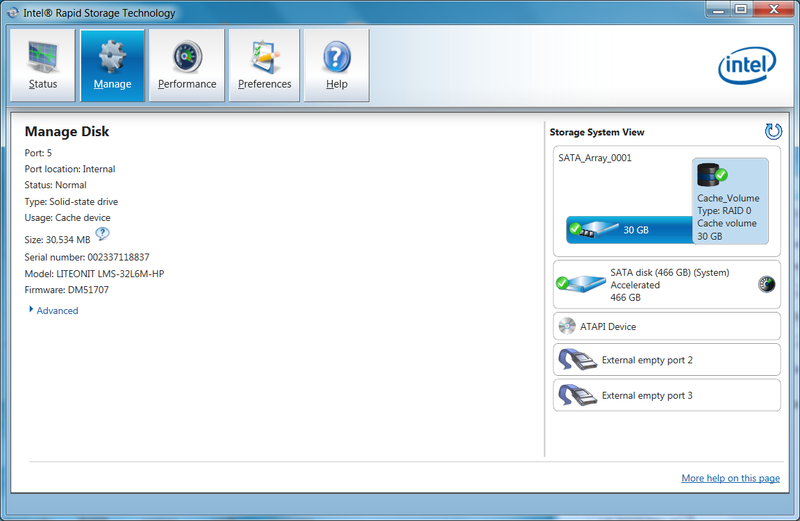 Up to 32 GB can be configured. 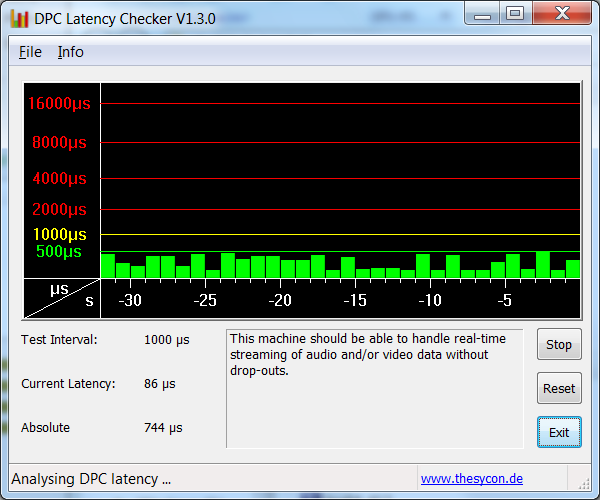 DPC Latency Checker shows no latency issues even with wireless radios active. 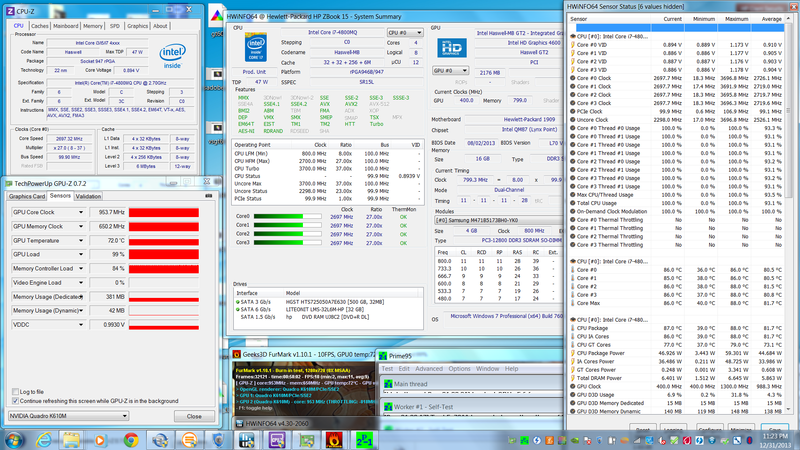 The i7-4800MQ in our test model returns similar synthetic benchmarks results as other notebooks sporting the same CPU. For example, its multi-core performance in wPrime 1024m of 266 seconds and single-core performance in Super Pi 32M of 578 seconds are similar to the Precision M6800. 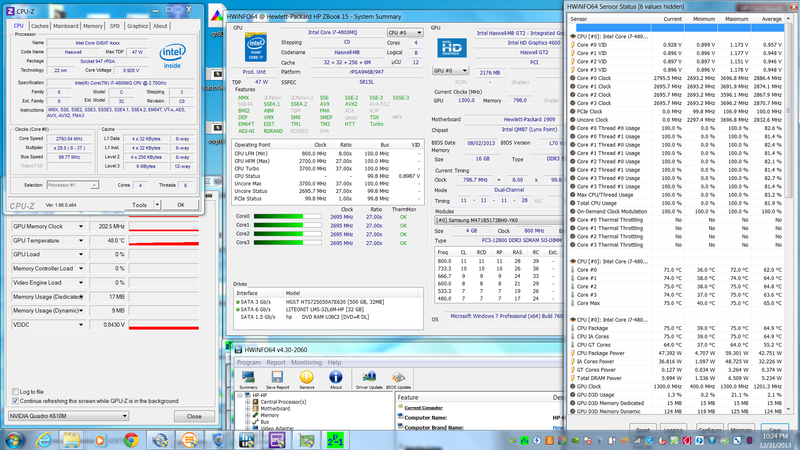 Compared to the previous Ivy Bridge generation, our Haswell processor is most similar to the i7-3740QM in specs and performance. 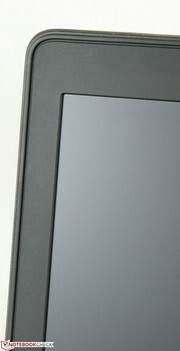 The die size of the i7-4800MQ is slightly larger due to the upgraded integrated graphics core. 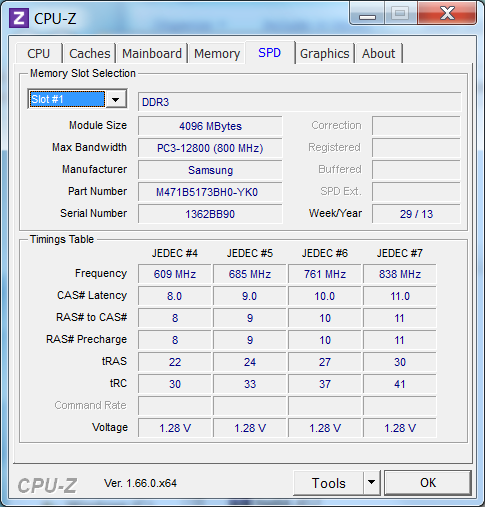 More information and benchmarks on the i7-4800MQ can be seen in our dedicated page here. 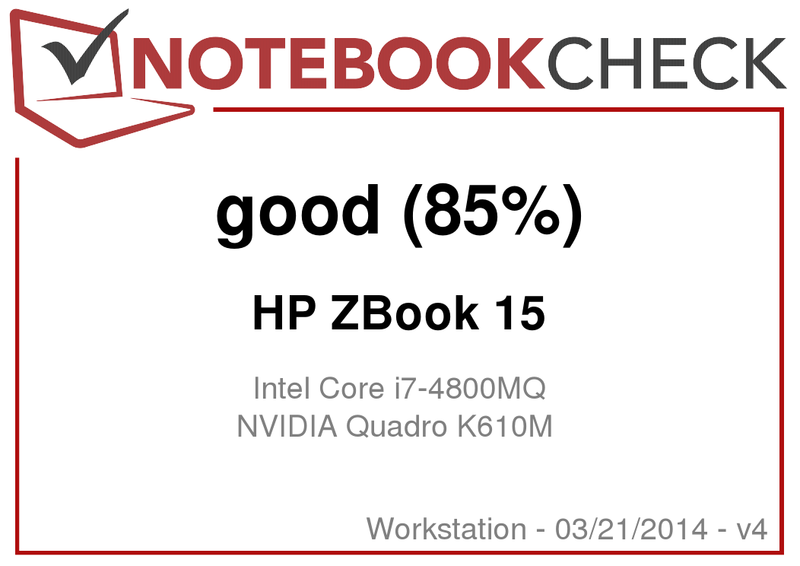 The high PCMark 7 score of 5798 points puts our ZBook 15 near the top of our benchmarks database and could have been even higher if it had been equipped with dedicated SSDs. 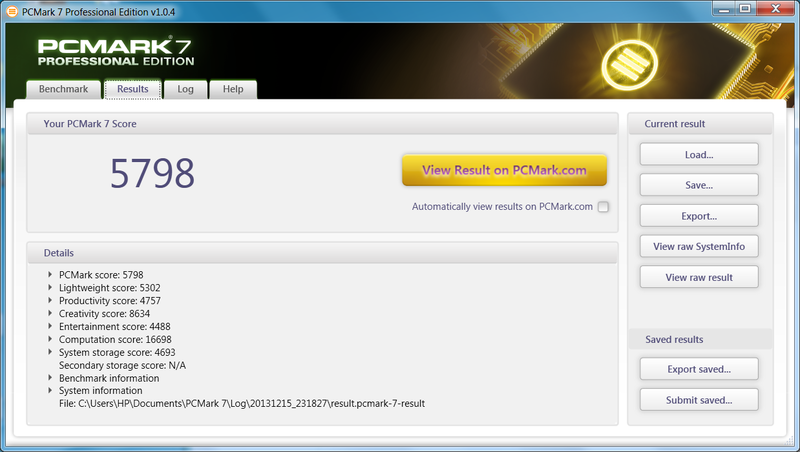 The score nearly matches our Asus G750JH, which uses a slightly slower i7-4700HQ processor paired with a Lite-On SSD. 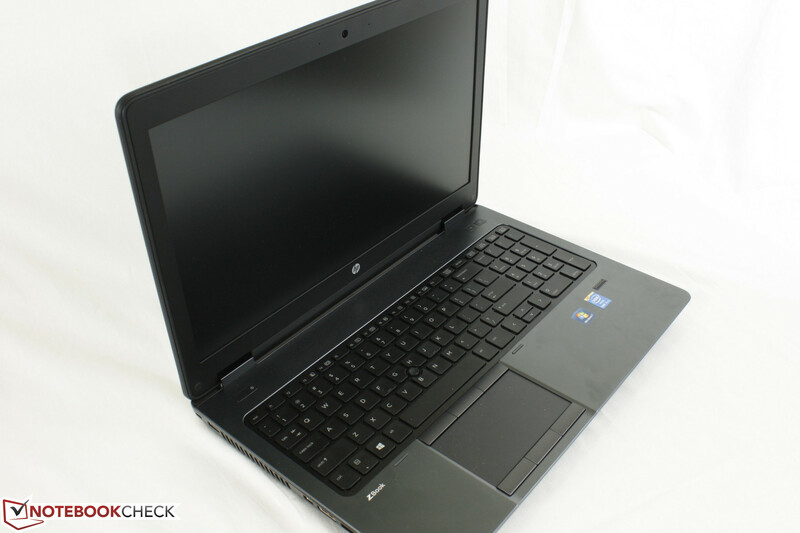 PCMark 8 Home shows similar results as the HP is able to match or outperform many notebooks with the SSD and GPU advantage including the Gigabyte P34G and Razer Blade 14. The Windows 7 Performance Index shows a system bottlenecked by its HDD, which is common for high-end notebooks equipped with mechanical drives. Even so, the system feels subjectively fast and almost as instantaneous as an SSD-based system. 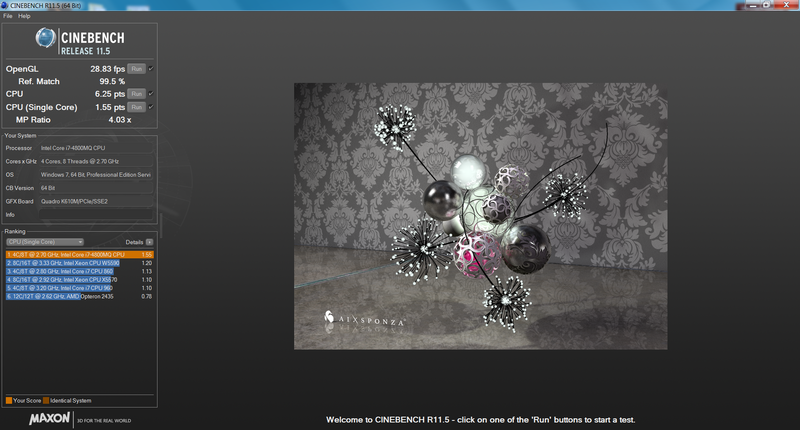 Since our system shipped with Windows 7, navigation is free from the animation-heavy UI that can feel slower on HDDs. The Hitachi Travelstar Z7K500 returns an average of 93.3 MB/sec on HD Tune, which is very good for a 7200 RPM SATA III mechanical drive. 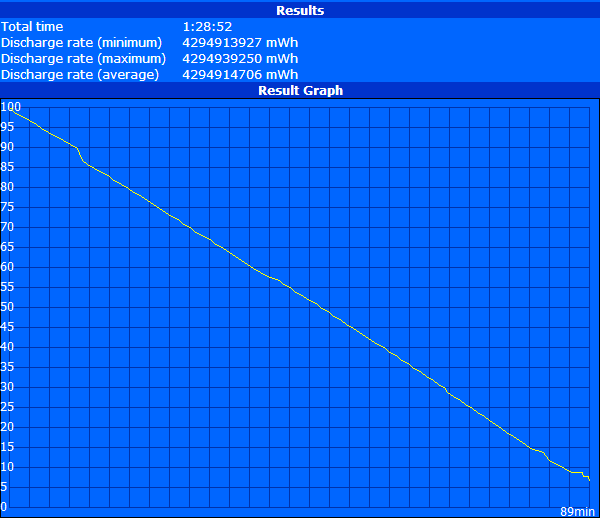 Slower 5400 RPM drives are typically less than 80 MB/sec on the same benchmark. 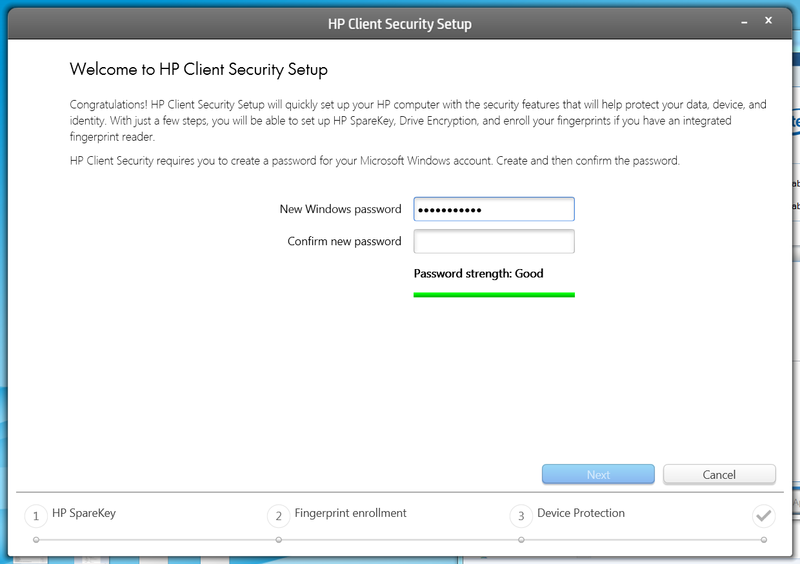 Users can configure self-encrypting HDDs or upgrade to SSD solutions. 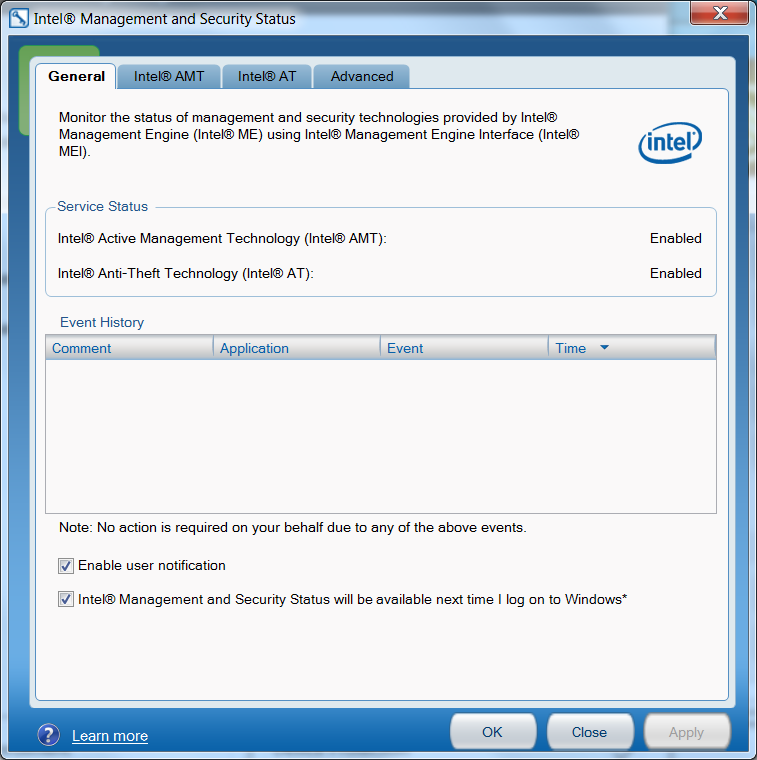 If no dedicated SSD is selected, users can configure an SSD cache via the mSATA drive. Our Hitachi HDD is paired with a 32 GB Lite-On LMS-32L6M-HP drive to hasten frequently used applications. Such a solution is common on budget notebooks as it is cheaper to include a small SSD than a 128 GB SSD or larger as a primary. In this case, users may prefer our setup for the additional storage capacity of HDDs. Upgrading the HDD or mSATA requires no screwdrivers, but be sure to use a 7 mm drive for an easier fit on the 2.5-inch interface. 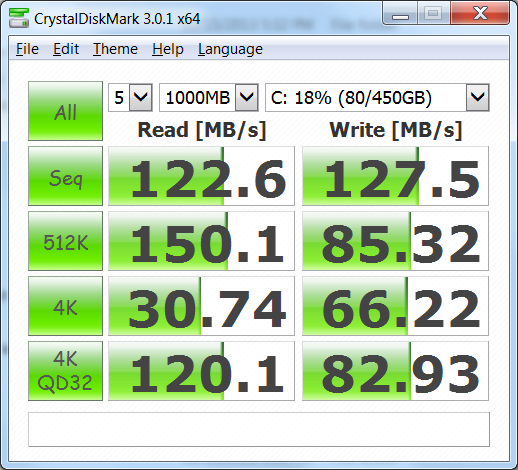 See here for our growing comparison table of HDDs and SSDs for more benchmark information. Our ZBook 15 is equipped with a 1 GB GDDR5 Quadro K610M, which is the lowest available discrete GPU option. The GPU idles at 135/202.5 MHz core/memory, but will otherwise operate at its full 954/650 MHz speeds. 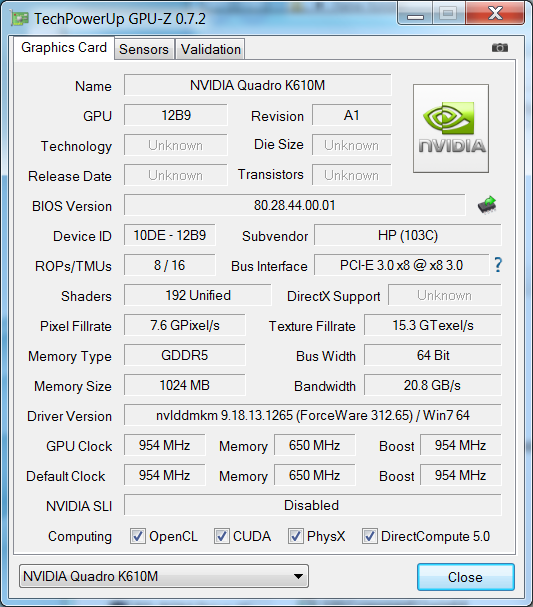 The other two GPU options are the Quadro K1100M and K2100M, both of which are notably faster than the K610M. 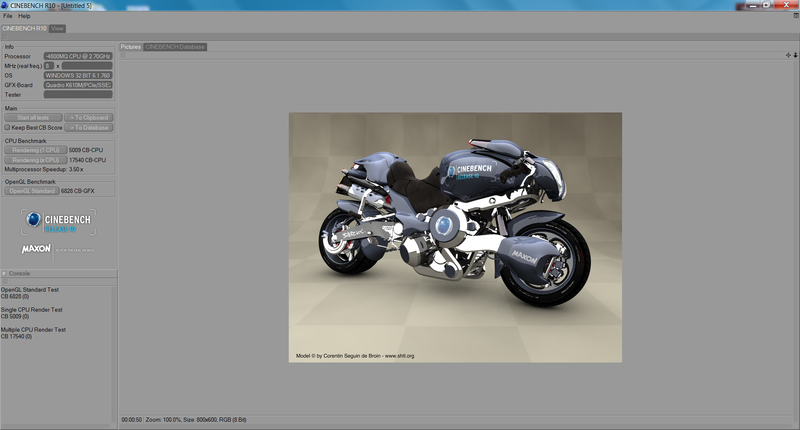 The K1100M in the Eurocom Racer 3W, for example, is notably faster on all tests in SPECviewperf 11. Users with more demanding GPU work may find it more beneficial to choose a higher GPU option in lieu of a faster CPU. It is a bit disappointing to see no higher GPU options from HP considering the price and scale of the ZBook 15. A Quadro K3000M option, for example, would be an even larger performance upgrade due to the quadrupled memory bus width (256-Bit vs. the 64-Bit 610M). Upgrading the GPU will require disassembly beyond the maintenance hatch underneath the notebook. Gaming performance is mediocre and most similar to a GeForce GT 720M. 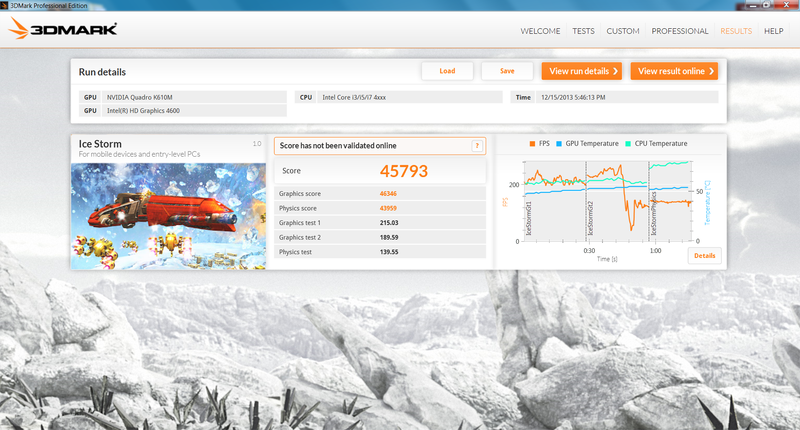 Our 3DMark 11 score is not unlike the Kepler GT 630M in our HP Envy dv6 or Asus K55VM. Quadro drivers are unoptimized for such tasks, however, as the ZBook 15 was not designed as a gaming machine. Nonetheless, gaming is possible including demanding 3D games at low enough resolutions or settings. An idling system will produce fan noise of about 36 dB(A), which is audible and high for a system at rest. 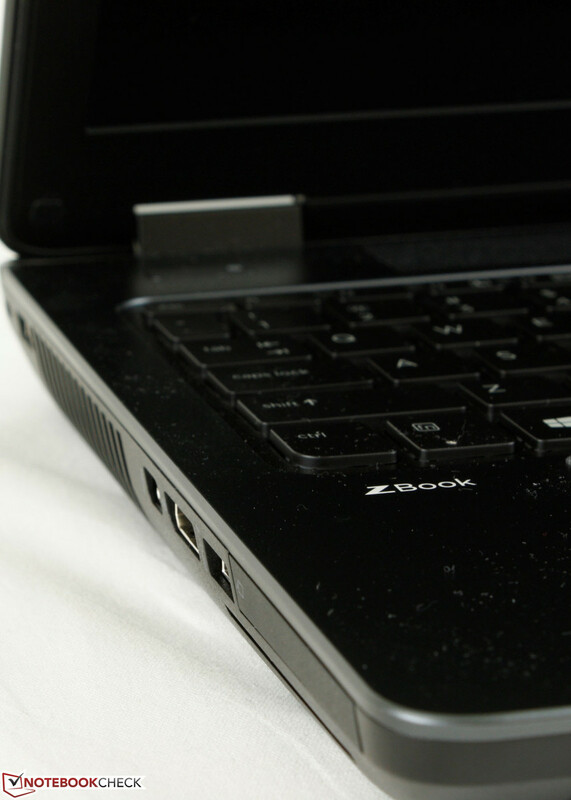 The ZBook 17, for example, is almost 10 dB(A) lower and our ZBook 15 model is louder than both the Precision M4800 and previous EliteBook 8570W. 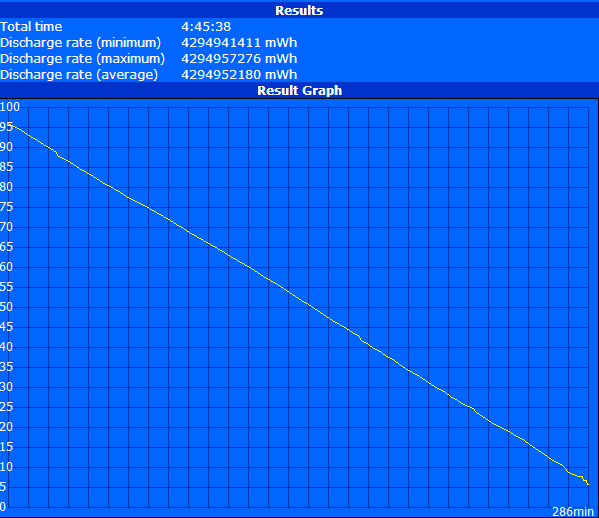 Fan speed will not decrease any further if on the Power Saver profile. Fortunately, the idling fan speed is consistent under light loads such as web browsing, word processing and related multi-tasking. This means no distracting pulsing of the system fan during everyday use and that higher loads are required to bump up fan speeds. Once fan speed picks up, however, the ZBook 15 is really no different than other workstations in terms of fan noise as the 40 - 45 dB(A) range is common under heavy loads. The relatively high fan speeds and sufficient ventilation have resulted in low surface temperatures all around. Idling temperatures are uniform with no standout hot spot on either side. Under maximum load for over an hour, we were able to record a maximum of 35.2 degrees on the quadrants nearest the ventilation grilles. Surfaces closest to the optical drive remain almost unchanged in temperature, so users may feel a large difference between both hands when typing. 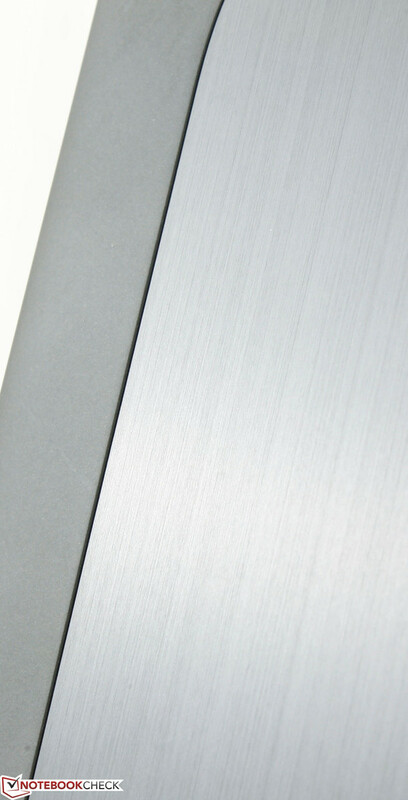 EliteBooks are typically very good at maintaining lower surface temperatures under load, so the same is expected from the new ZBook series. Competing workstations like the ThinkPad W530 or MSI GT60 reach much higher temperatures (upwards of 50 degrees C) with steeper gradients. 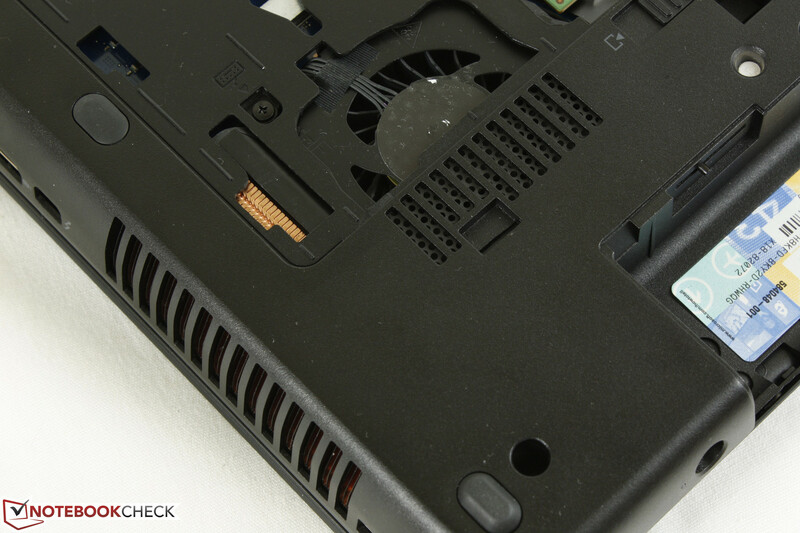 The Precision M4800 has low maximum temperatures as well, but higher idling temperatures compared to our ZBook 15. (+) The maximum temperature on the upper side is 35.2 °C / 95 F, compared to the average of 37.1 °C / 99 F, ranging from 23 to 69.8 °C for the class Workstation. (+) In idle usage, the average temperature for the upper side is 23.9 °C / 75 F, compared to the device average of 31.1 °C / 88 F.
We stressed the system with CPU-Z, GPU-Z and HWiNFO64 as monitoring tools to identify any throttling or stability issues. With Prime95 active, the CPU was observed to be operating at its maximum clock of 3.5 GHz for four active cores, but this slowly clocked down to a more stable 2.7 - 2.8 GHz range over time. The CPU was stable at about 77 degees C.
With FurMark active, the discrete Nvidia GPU was observed to be operating at a stable 953.7/650.2 MHz core/memory while maintaining a temperature of about 56 degrees C. The clock rates never dipped or increased beyond their respective values. 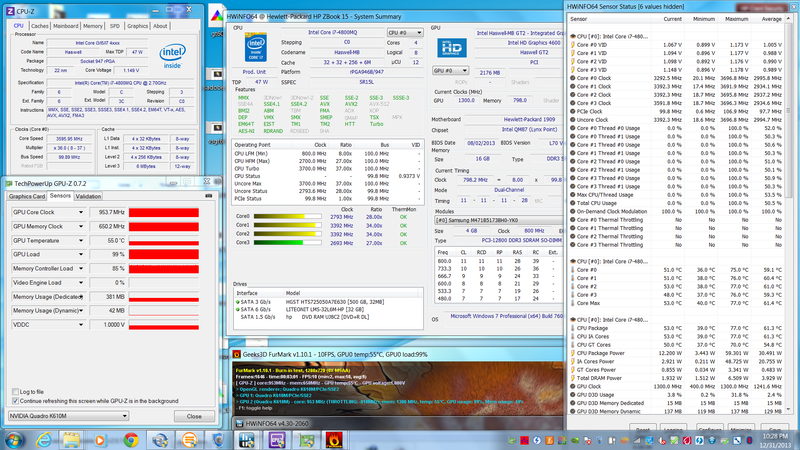 With Prime95 and FurMark active simultaneously for over an hour, the CPU was able to maintain its base 2.7 GHz clock while the GPU had no issues at 953.7/650.2 MHz for its core/memory. 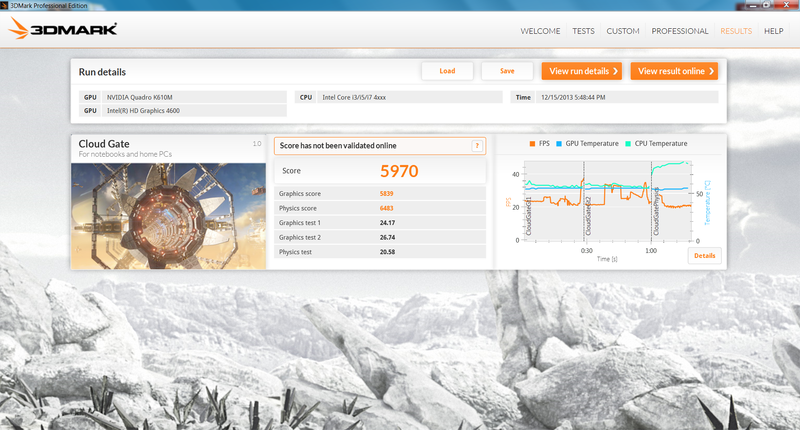 Temperatures rose as expected up to 87 degrees C and 70 degrees C for the CPU and GPU, respectively. Nonetheless, the system was stable throughout the test with no throttling issues. 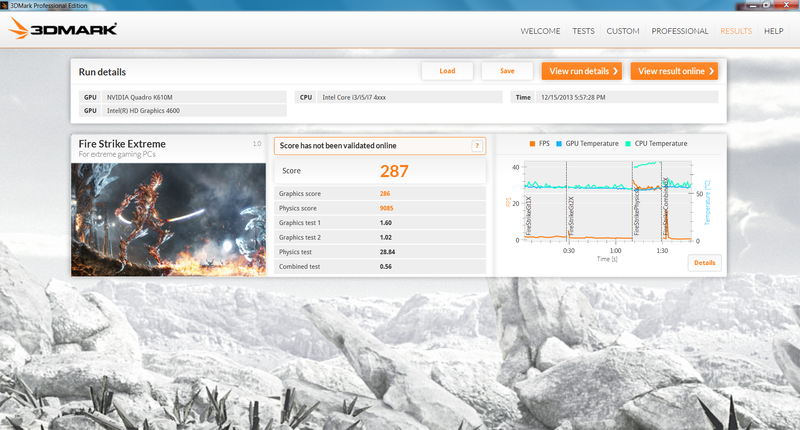 A separate 3DMark 11 run immediately following the stress test returned numbers similar to its pre-stress state. 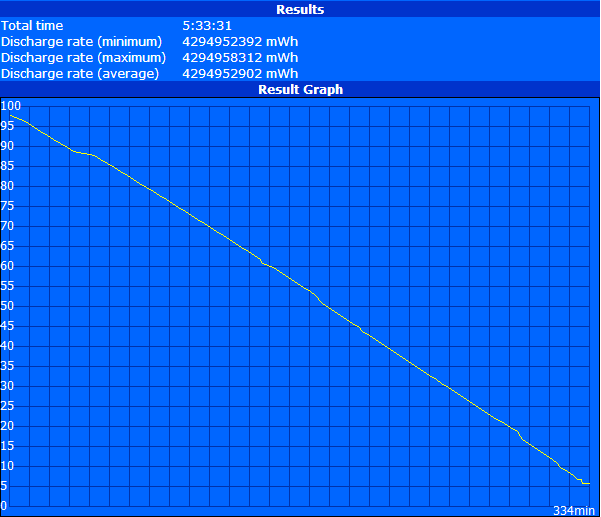 Running on batteries will reduce system performance. 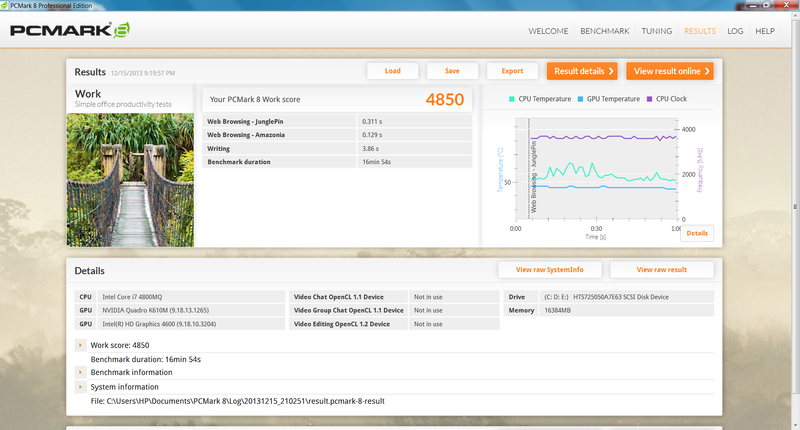 a 3DMark 11 run on batteries returned a lower CPU score (7171 points vs. 7896 points on AC power). 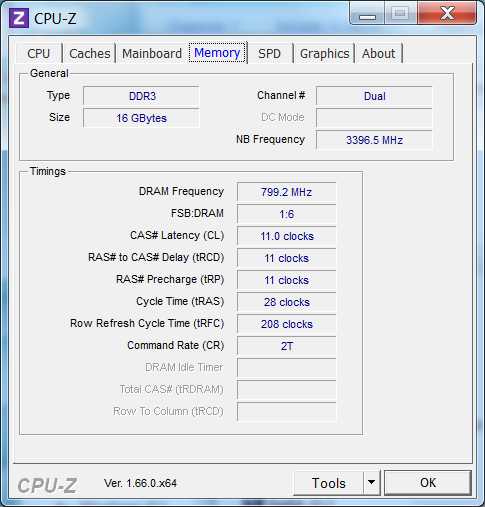 This is because Turbo Boost is automatically disabled if disconnected from an outlet, so CPU speed never exceeds its base 2.7 GHz. 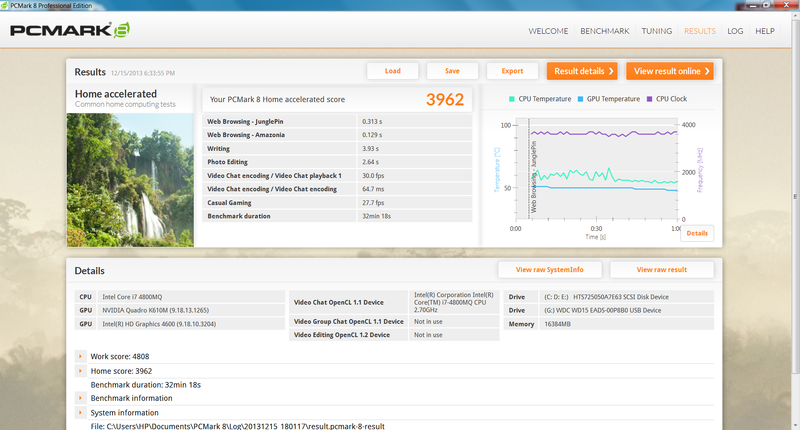 GPU performance, however, will be unaffected (1134 points vs. 1136 points on AC power). The stereo speakers are located above the keyboard and in between the Power and Wireless buttons. They are capable of DTS sound and produce a balanced output for enjoyable music and movies. Bass could have been deeper, but it is still very good nonetheless. Maximum volume will not distort audio or vibrate the notebook in any way. For the occasional media playback, the internal speakers are sufficient enough even without external 3.5 mm solutions. Our model is equipped with an 8-cell 83 Whr Li-Ion removable battery. A smaller 8-cell 75 Whr battery is also available in addition to secondary 9-cell 100 Whr or 75 Whr modules that connect to the docking port. When on minimum brightness with wireless radios disabled on the Power Saver profile, our notebook was able to last for about 5.5 hours. When on maximum brightness with wireless radios active on the Performance profile, our notebook was able to last for about 1.5 hours while running the Battery Eater Classic Test. 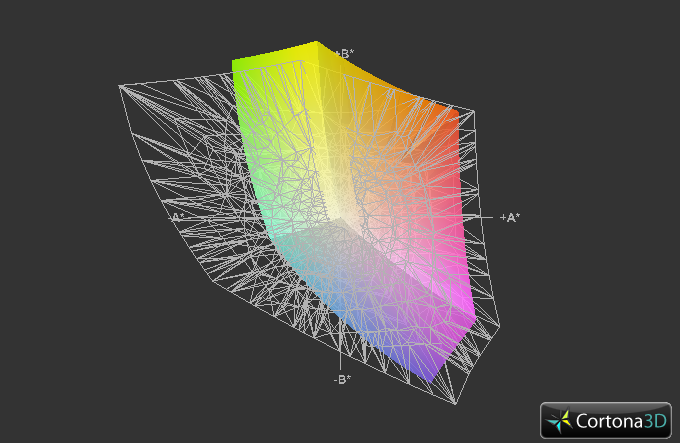 Our more realistic WLAN test puts the backlight at 150 nits (about 70 percent brightness setting) on the Balanced profile while running our looping browser script. Under these conditions, the notebook lasted for about 4.5 hours. 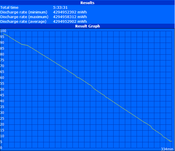 The integrated GPU was active for all tests except for the minimum runtime test. Our results are more or less similar to many other 15.6-inch workstations we've tested, including the MSI GT60, Precision M4700 and Precision M4800. 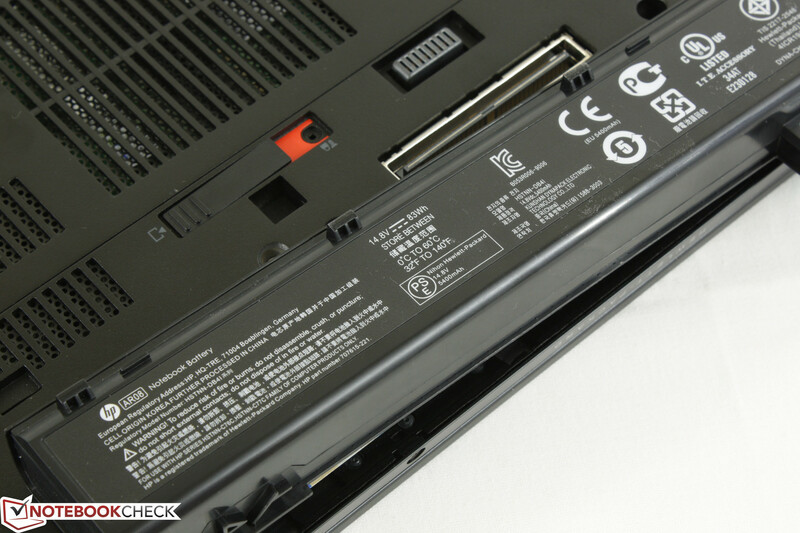 Most notably, the ThinkPad W530 can potentially last for much longer while the EliteBook 8770w has a much shorter battery life in comparison to the ZBook 15. 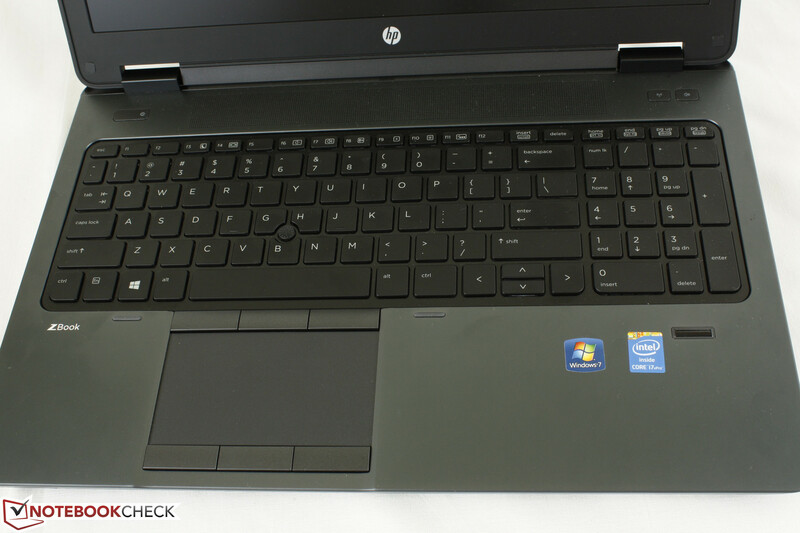 The inclusion of Nvidia Optimus is new for an HP workstation and also partly explains how the newer ZBook models tend to have longer runtimes than past EliteBooks. 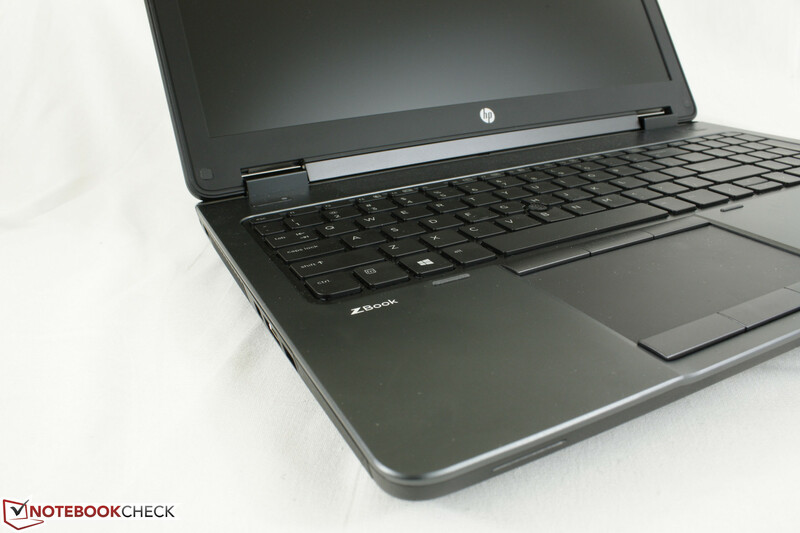 Like the ZBook 17 and the EliteBooks before it, we have been impressed by HP's mobile workstations and we expected nothing less from the ZBook 15. The manufacturer delivers yet another knockout punch in what is essentially a smaller ZBook 17 with no compromises in quality or features. Speaking of quality, the ZBook 15 is one of the most well-made workstations we've seen with style and rigidity to back it up. Upgrading is made easy to give the notebook long legs, though accessing the CPU and GPU to clean the heat sink can be a pain for novices. 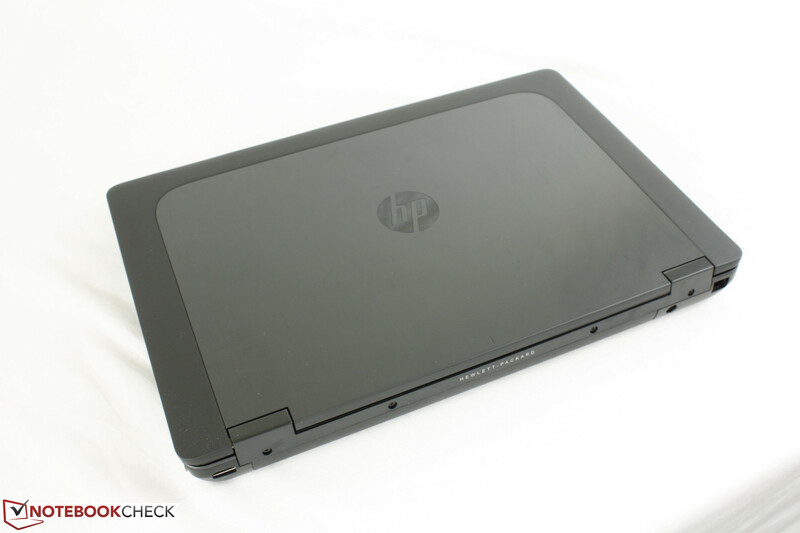 Nonetheless, we're big fans of the screwless hatch design and wish to see it incorporated beyond HP's workstations. 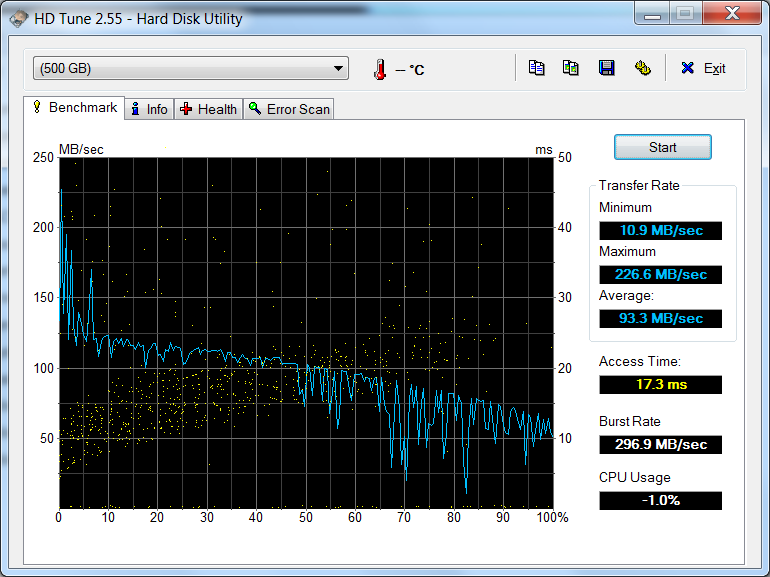 System performance is fast even on a 7200 RPM HDD. For even better speeds, however, we suggest installing a primary mSATA drive with a secondary 2.5-inch HDD for storage. This should provide consistently fast speeds with plenty of storage space instead of SSD cache accelerating only certain applications. 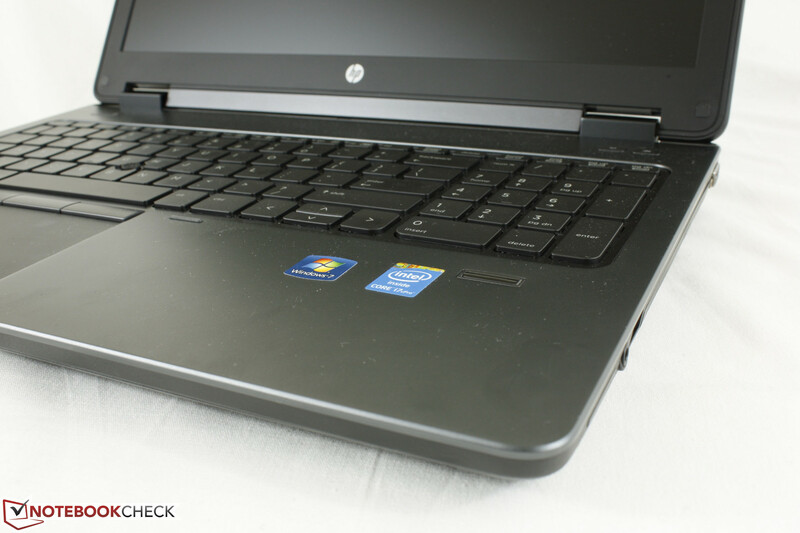 Minor complaints include the fan noise and reduced CPU performance on batteries, but these may not apply to users who intend to keep the notebook plugged and out of ear's reach. A more major complaint is is the average CAD performance as GPU options above the mid-range Quadro K2100M are not available. Higher display resolutions above 1080p are not available either, unlike the Precision M4800. Despite the small list of flaws, the ZBook series will only get better from here. 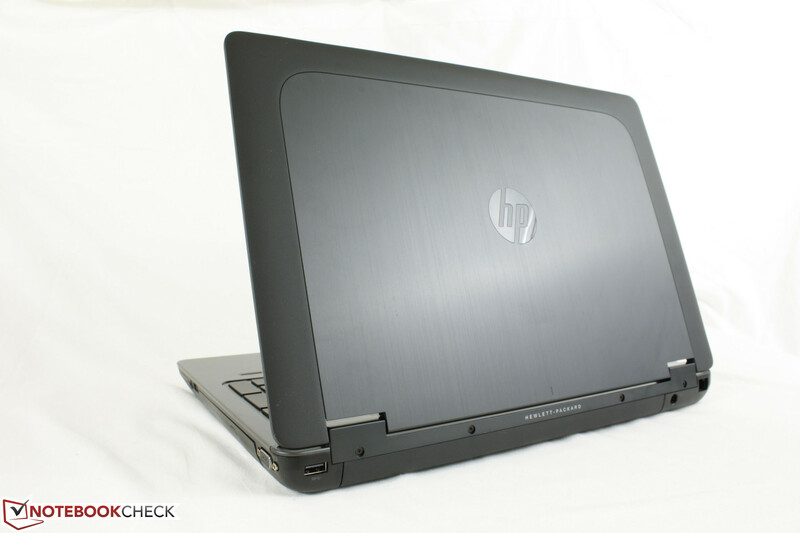 Its first round of models are already some of HP's best workstations and we can't wait to see what the second generation will bring. 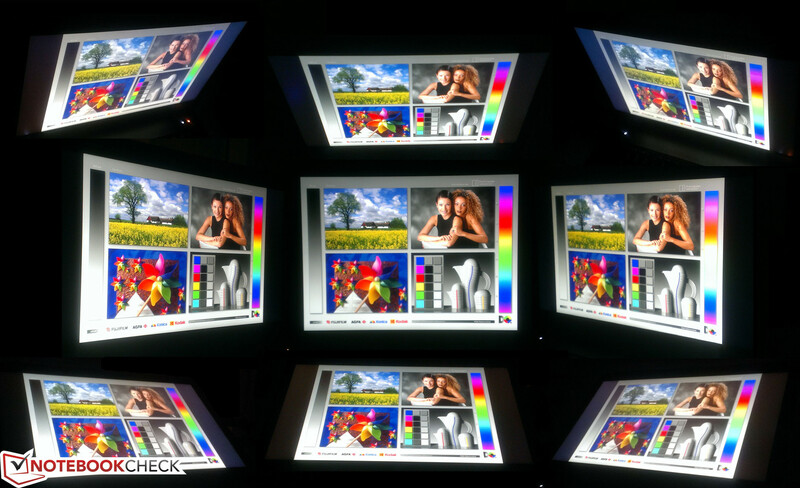 We're crossing our fingers for a DreamColor display beyond 1080p. February 16, 2014 update: The ZBook 15 supports RAID 0 and 1, contrary to what was stated in our review. This has been corrected. Thank you readers! Superb build quality and construction. Fast system performance with professional looks and feel. The easy upgradeability and long list of connectivity options will give it long legs down the road. a snap on/off modular optical bay for secondary batteries or hard drives. Easier access to CPU/GPU and lower fan noise. 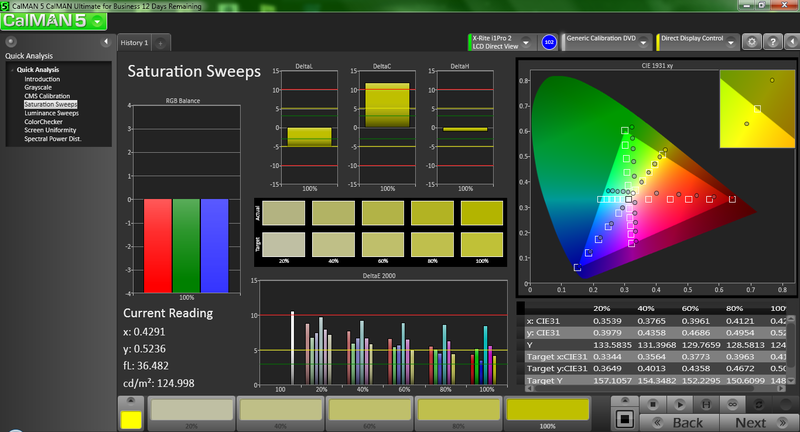 Higher resolution options will be a must in the near future. Very sleek for a business-centric workstation.